Another aim we had was to streamline the look of our online presence so that our real-world site’s natural elegance would come through more clearly – we hope you agree that we were successful in achieving that. Not only does the new website more accurately reflect the old-world grandeur and comfort of The English Inn, Restaurant and Pub but the content has been re-organized for greater clarity and accessibility. Now it’s easier to find and navigate among our offerings for Michigan lodging, dining, specials, and see what we can do to host your Lansing weddings, corporate retreats, reunions, and other get-togethers. The English Inn, Restaurant and Pub is a popular Lansing, Michigan lodging, dining, and event facility with a long history and plans for a similar future. We hope our beautiful, new site will help express our intent to continue this long and respected tradition of offering uncommon opulence and atmosphere in a peaceful countryside setting at our inn, restaurant, and our pub. 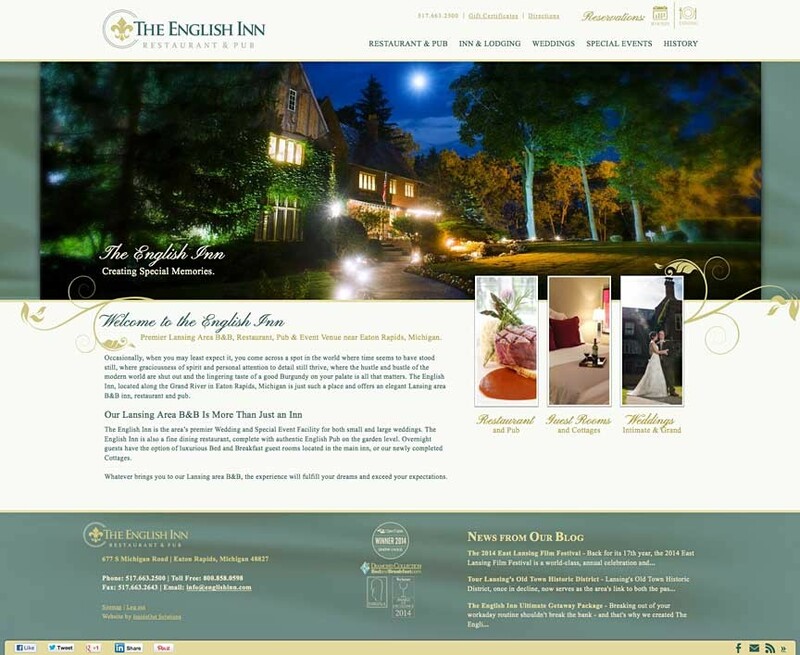 I took the liberty to check out your website for The English Inn…very impressive. You can reach me on my cell at any time…231-218-5529.